Ball-like lignin particles developed by researchers open up completely new possibilities for the utilisation of lignin. Plastic is everywhere. Massive barges of plastic waste float in our seas. A plastic bag and other plastic waste have even been found in the nearly 11-kilometre-deep Mariana Trench, the deepest known point in the world's oceans. Plastic waste is one of the biggest pollutants threatening our oceans, lakes and food chain. Over one third of waste is made up of microplastics, particles that are less than five millimetres in size. According to numerous estimates, in 2050 there will be more plastic than fish in the seas. Can we influence this trend in any way – could fossil materials used as the raw materials for plastic be replaced with biodegradable options? "Lignin is an excellent alternative as a replacement for fossil materials. It is created as a by-product of pulping. Cellulose is a common material that is often discussed and researched, but lignin has not been given as much attention", replies Professor Monika Österberg. Österberg, a professor of Bioproduct Chemistry wants to change the world. Climate warming, the depletion of fossil-based raw materials, population growth and increasing waste problems have upped the need for renewable materials and products that will break down biologically. The promotion of circular economy is very important with regard to ensuring sufficient resources and their more effective use. Lignin, which is an adhesive for wood fibres, has primarily been burned as energy due to its high heating value. However, its potential on the market is much more versatile. Interest in further processed products has grown quickly. The value of refined lignin can be ten times that of burnt lignin. be a raw material for carbon fibre in, for example, cars and airplanes, as well as a material in production of bioplastics and liquid fuels. The ways in which lignin can be used are believed to be almost unlimited. Why then are there still so few lignin-based products on the market? "Lignin's potential has been researched for years. Lignin is a complex natural polymer, and its structure is challenging. For this reason, its utilisation and processing into products is difficult", Österberg states. In May 2018, the two-year long COLIAD project (COLIAD, Colloidal Lignin adhesives and coatings) financed by Business Finland came to an end. During the project, researchers from Aalto University and VTT Technical Research Centre of Finland with the support of companies examined lignin's potential as a highly refined bioproduct that could be produced in large volumes. Researchers were able to successfully use a simple method to develop ball-like colloidal lignin particles (CLP) from lignin. The particles are even in their surface characteristics and size, while lignin is complex in structure and composition. These particles, which are approximately two hundred nanometres in size, can be easily mixed with water or other mediums, and their surface chemistry is easy to mould so it is suitable for various applications. As their production is so simple, lignin particles are well-suited for mass production. A second objective of the project was to mould lignin particles, so that they are suitable for use in high-quality, durable and economic wood adhesive and coating applications. The results were promising. It was found that phenol in glues could in part be replaced with lignin particles, and they proved to have great potential in coatings as a form of UV protection. However, more research as well as product-tailored commercialisation plans are needed before competitive products can be put on the market. Much has been learned about the production and moulding of lignin particles during the COLIAD project. The utilisation of lignin in its colloidal form, meaning in small particles under a micrometre in size, is still new, and the best applications are undoubtedly still to be found. "The new areas of application facilitated by these ball-like particles include carriers in pharmaceuticals transport, water treatment and biocatalysts. We published an article on the study of these some time ago in Nature Communications. The work that has now been started will promote the future research of lignin particles and the commercialisation of products. 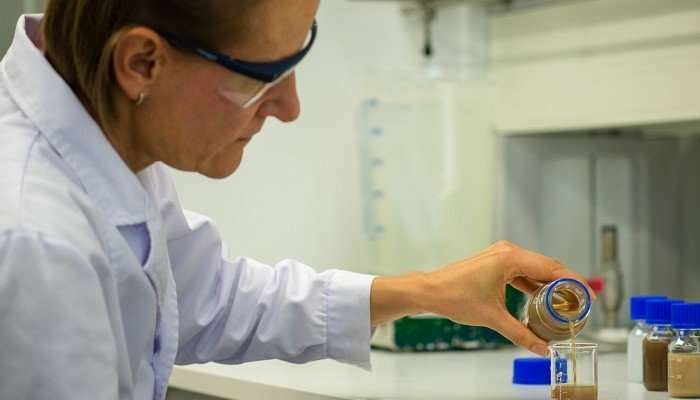 The production of these particles is already possible in batches of several kilogrammes, which makes it possible to test them in different applications. This could prove to be a competitive advantage in the global market for Finnish companies and an opportunity to create new business and jobs." The pollution of water from plastic waste has raised much concern. The problem can be limited by increasing the use of renewable raw materials, such as lignin, in packaging and textiles as well as by improving the effective recycling of these materials. Lignin particles offer even more options for the utilisation of lignin. This is why a professor, who dreams of changing the world, has selected them as her area of research. They say in the paper & pulp industry, you can make anything out of lignin except money. The value of refined lignin can be ten times that of burnt lignin. The reason why it is burned in pulp processing factories is because it replaces fossil fuels needed for process energy. The main energy demand is for hot steam, and for reforming the chemicals used for the pulping process. If the lignin is not burned for heat then, well, you're going to burn oil or gas instead because electricity is way too expensive and heat pumps don't run hot enough. So your choice. The plant that produces the lignin is going to consume fossil fuels instead of the lignin if you choose to refine it.